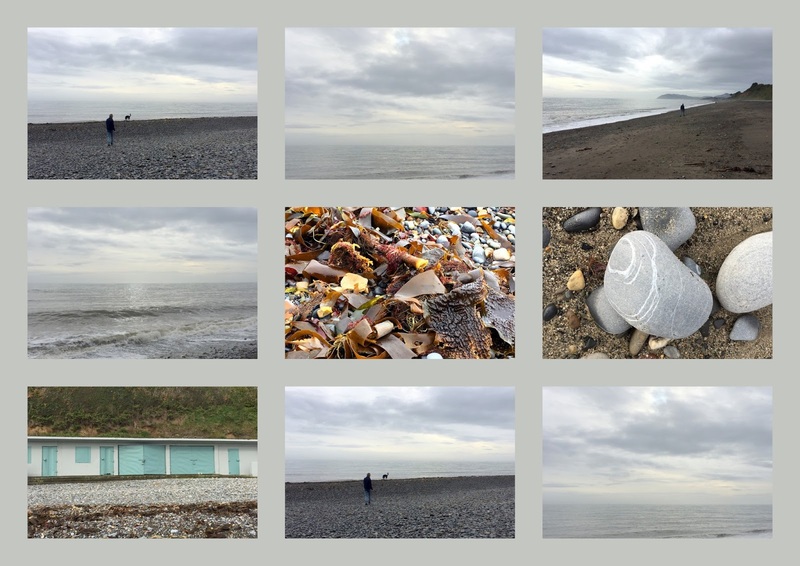 Now that the day trippers and swimmers are gone, us dog owners can reclaim Killiney Beach! I've missed going there in the summer months, but I fully intend taking our Sunday morning walks there as much as possible over the winter. Last Sunday, I overslept a bit - I actually got to listen to World Report on RTE1 radio, a program I hadn't heard in years. But we still managed to make it. I had to cut short my weekly Skype call with Shinobu, but we'd had a good chat the previous week, so I didn't feel too bad. And of course, Timber loves the beach. Actually, I should say he LOVES the beach! A big open space to run around. Plenty of other dogs. Seaweed (he's not allowed to eat it, but he can trade any bit he picks up for a piece of kibble by responding to the Drop command, and he probably still gets to eat a little bit of it anyway). The chance of a piece of crab, or fish, or, on one occasion a sheep carcass. There is one thing he doesn't like, though. And that's the water. He might be ok with getting his paws wet, but there is no way he will go in swimming. That's the half Malamute in him, definitely. And probably confirmation that the other half is not Labrador. And I love the sea. One of the reasons why I couldn't live anywhere else. 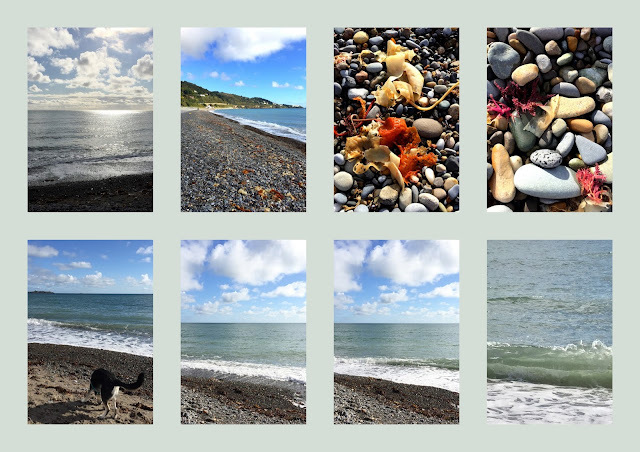 I can drive to Killiney beach in 12 minutes (at the weekend, early in the day), and walk the beach, feel the breeze, smell the air, chat with my husband. And then go home and start my day. What else would I be doing on a Sunday morning? And every week it's different. So much inspiration for paintings. Not enough hours in the day, not enough years to live!! But I'll keep collecting the memories. Sometimes, it's good to intensely practise a particular skill. Sometimes it's good to take a little break (and to catch up on the more mundane tasks, like paying bills (something I'm quite good at) and keeping the house tidy (not so good)). 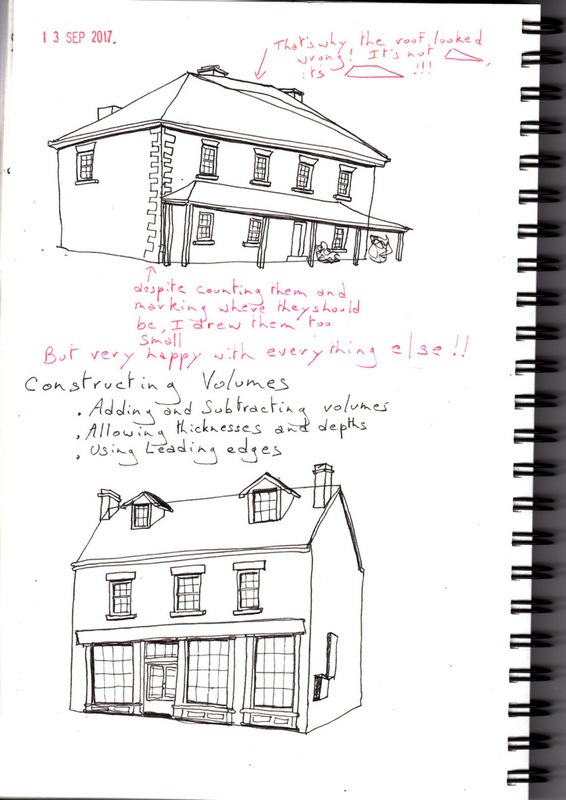 Last week, I was in an intense phase of learning how to sketch buildings. Not so much in the last few days, but I'm planning to get back into it by the end of this week. Still practising adding and subtracting volumes, working on leading edges and noticing the thickness of elements like gutters and window sills. I have improved my windows somewhat but need to continue working on the proportions - most of my windows are still too wide. I picked this little house in the Airfield estate for two reasons: One it's just round the corner from where I live, so I could fit it in without impacting the bill-paying and de-cluttering tasks too much. Second I knew this house, I call it the Creamery, I'm not sure if it ever was a creamery, anyway, I knew the area in front of this house was going to be quiet - it's not interactive enough for children, and there is no coffee on offer for adults. And of course, Airfield in general is a good spot for sketching (apart from the €10 entry fee - we used to have an annual pass, but since we got a dog, we haven't bothered - we get enough walking as it is) - lots of interesting architecture, old and new, trees, flowers, animals, people. And Oh My God They're already advertising Christmas! That has to be at least on a par with Brown Thomas! And a bigger version of the final sketch. Do I like a challenge? I would normally say yes, but I'm not so sure now, after tackling this corner of the Royal Hospital, Kilmainham (home to IMMA). 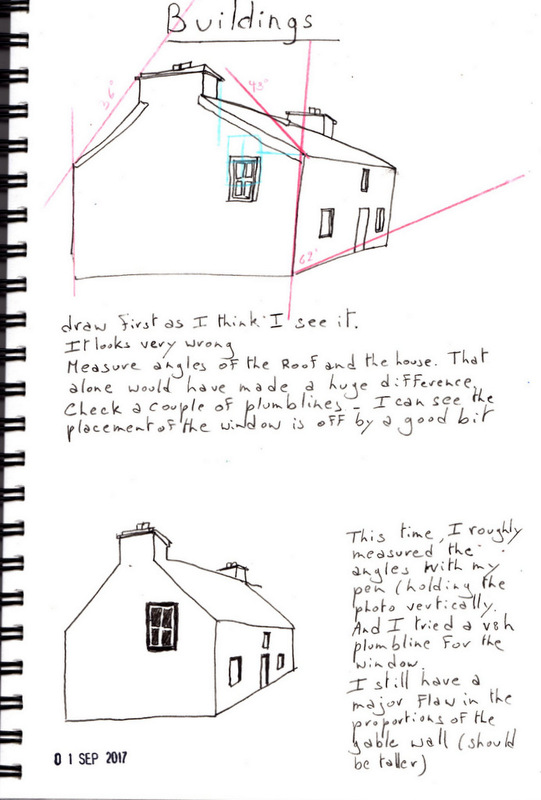 Last time I was there with Dublin Sketchers, I sketched a humble little shed - that was all I felt capable of. And I was really happy with how it worked out. That was in January of this year. It feels like a lifetime ago. It's been a busy year. 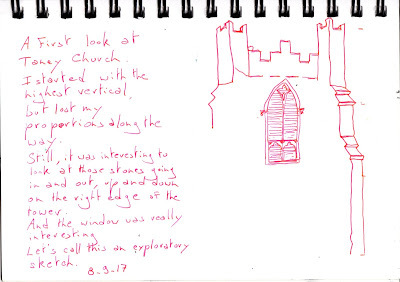 So, despite some serious proportional errors (ratio of chimney height to stained-glass window height, size of windows, to name just two), I am very proud of this sketch. 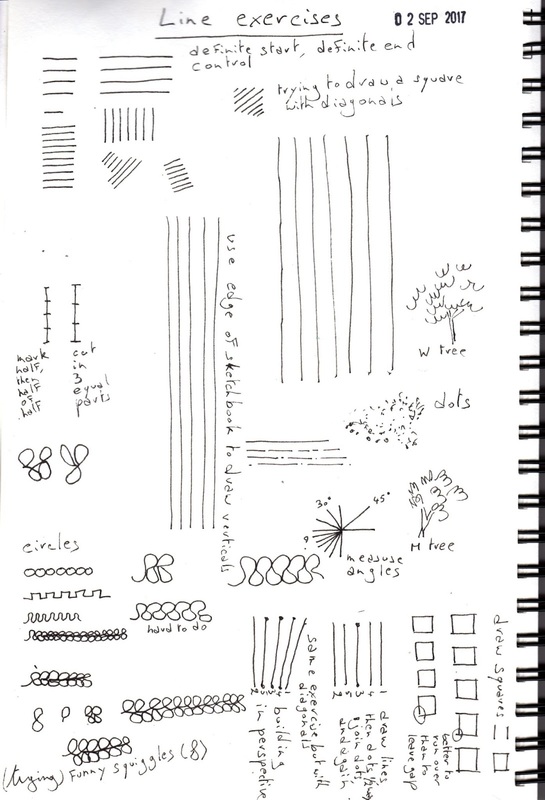 I actually measured and did a basic pencil sketch to figure out the positioning of the various elements. And I really tried to understand the building, to put into practise all I have learned over the last few weeks and over the last year. It was a beautiful afternoon, warm in the sun, cool in the shade. We're having a nice autumn so far - yes, we would have liked warmer temperatures, after a non-descript summer, but you don't always get what you wish for. At least we don't have hurricanes or monsoon rains in Ireland. And I found the perfect spot, a little out of the way (only one small group of Americans commented on my work, and that was only in the first half hour), with a good view of my subject. But I struggled with a few things: My favourite fountain pen ran out of ink (my own fault - I had another pen, though, but with a thicker nib). First page nerves too - it's never easy to start a new sketchbook, even if it's identical to my previous one (I'm sticking to watercolour-paper Moleskine - by the way, does anyone know what's the right pronunciation for Moleskine?). The main trouble I had was that my lower back started causing me major pain - it had been sore for a few days, but I thought I was better - hunching over my sketch for an hour and a half was not a good idea. 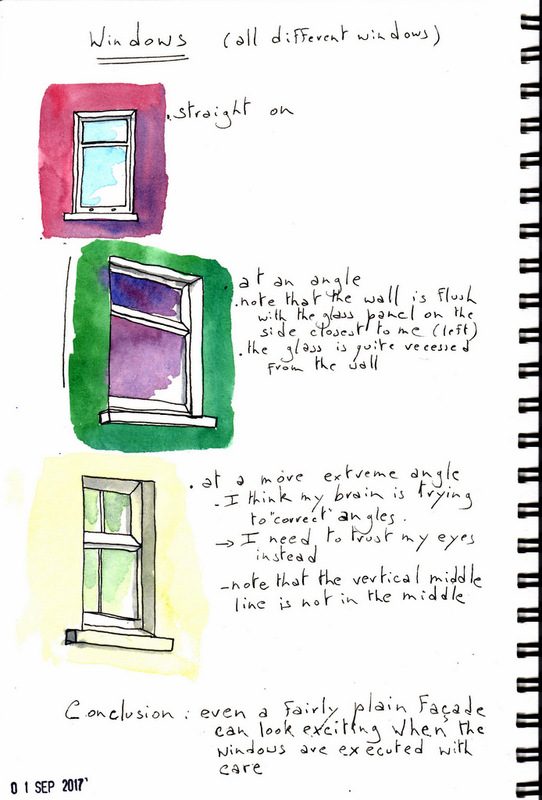 So I added the colour indoor and finished the windows at home. And I applied one of those heat belts - it really helped. Now, 4 days later, I still struggle with my back - I've done yoga for lower back pain and yoga for sciatica (a great YouTube class), I've walked, I've applied heat, I've minded myself. And when I think I'm better, it hits me again, like this morning, when I was tying my shoe laces before heading out for our dog walk. So here I am, writing this with a hottie against my lower back, and another one under my left foot. But I'm refusing to let it stop me! I'll be out sketching again soon. 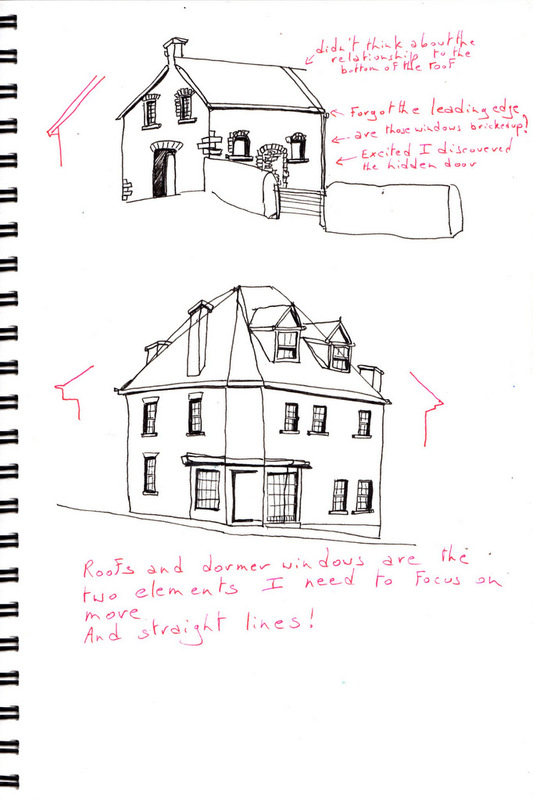 I won't bore you with the details, but lesson 2 is about adding elements that stick out (buttresses, window sills, etc. 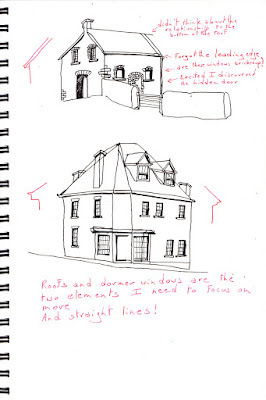 ), subtracting elements that stick in (windows and doors mostly), using the leading edge of the roof so that it doesn't sit on top of the house like a cardboard box, and realising that cornices, gutters, fascia and all those things are generally thicker than you'd think! I'm still at the stage where I get the shape of a roof completely wrong, so maybe I'm moving a bit too fast. But it's so much fun. 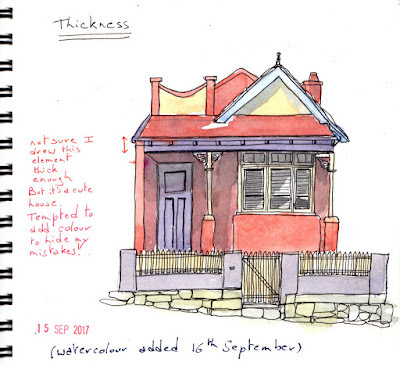 For this assignment, we went to Tasmania, where they have a lot of sash windows, which will be useful here in Ireland. And lots of dormer windows, which I hope never to have to face ever again! 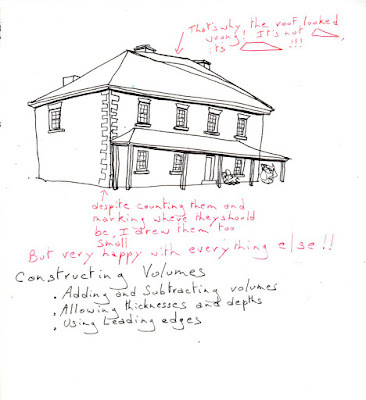 We had to pick one of the houses and draw it again, focusing on the areas we struggled with in the first drawing. This time I didn't rush so much. 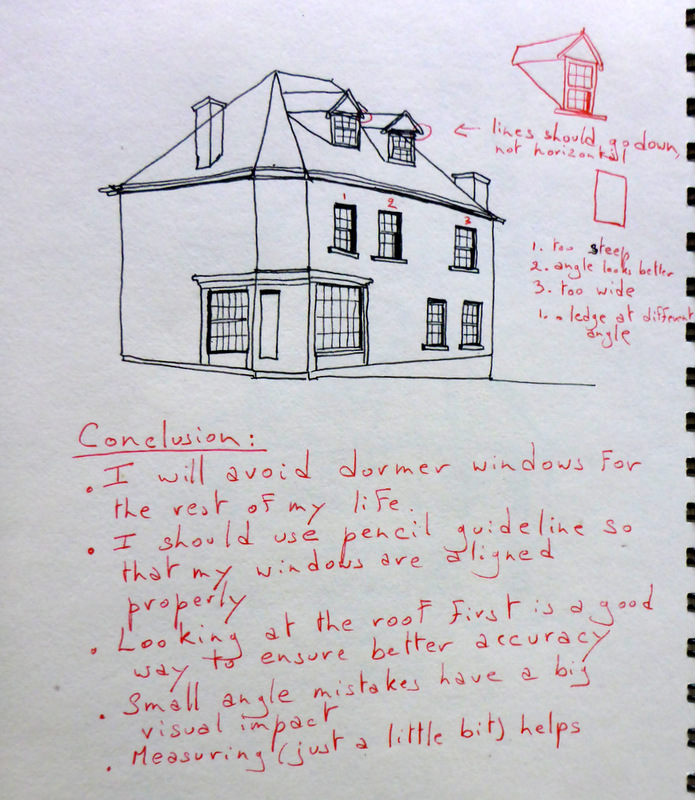 I worked hard at the dormer windows, but they're still not structurally sound. And I discovered that the right-hand side of the house is on a slope. Would you believe me if I told you it never occurred to me that a house build on a slope still has to have a horizontal base? Just as well I'm not an architect! And I couldn't help adding watercolour to one of them! Shouldn't have done that, but I couldn't help myself. At least I didn't destroy the original. I scanned it and printed it on watercolour paper. Then I added colour. Some aspects work, some don't. What would be really interesting as a process for me in future is to paint the overall shapes first, then draw the lines. Another day's work. Surprisingly, Bruce was still Down Under when I sketched this one! Maybe he was so fed up with me looking at the same building over and over, and painting it and drawing it, that he decided to go on a little holiday? I certainly felt that the work I put in the previous exercises paid off dividends here. I knew how each part connected to the next. The tower is still way way too short, but I love how the volumes stand clearly in front of each other. 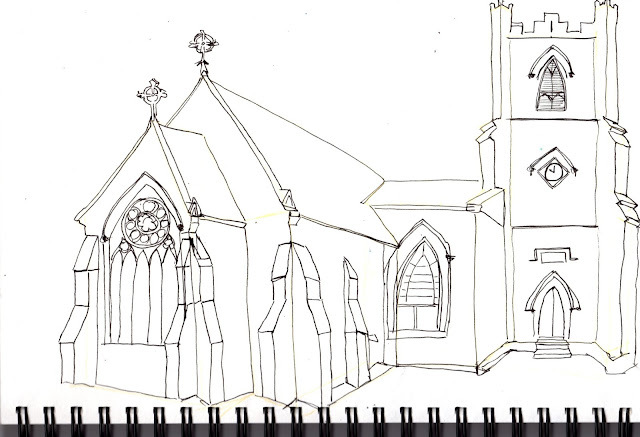 And buttresses is my new favourite thing! Great fun it was! Despite the tower, that's consistently too short. But at least I'm consistent! I even had children dropping by to have a look at what I was doing, including a little boy who was fascinated by my little box of watercolours. I wonder do children these days play with paints? Or do they spend all their time on the Playstation. Or at rugby practise? (I do live in South Dublin!). Is painting too messy? Are the parents concerned about toxic chemicals? That little boy looked like he'd never seen anyone paint before. Maybe I inspired him? Maybe his parents are cursing me right now. And Bruce was nowhere to be seen or heard. The way I like it! Into the big bad world. Outdoor assignment time! I dropped over to Taney Church to recce the area, and also to make sure it was ok to sketch there. I'd only brought my small sketchbook, and no chair to sit on, so I did this one standing up. It's not really a proper continuous line sketch, but it was a good way to look really closely at some of the aspects of the building that I found interesting. And also to realise that any building with a tower would pause serious challenges! I discovered at a later stage that the edge on the right, with stones going in and out is called a buttress! 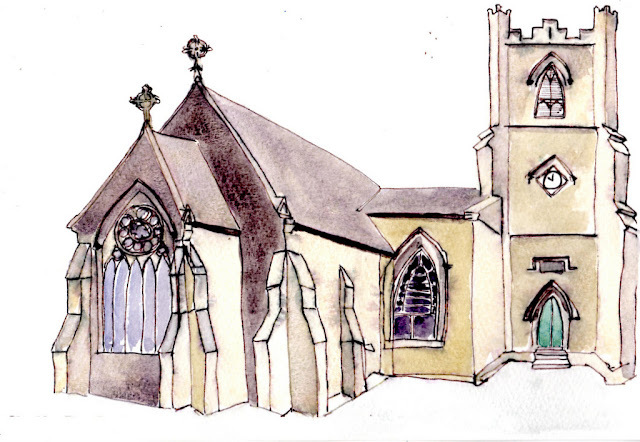 Well, if I'm going to sketch churches, I'd better be prepared to tackle those! No, I didn't go to Australia. We were there nearly ten years ago. And it was brilliant. 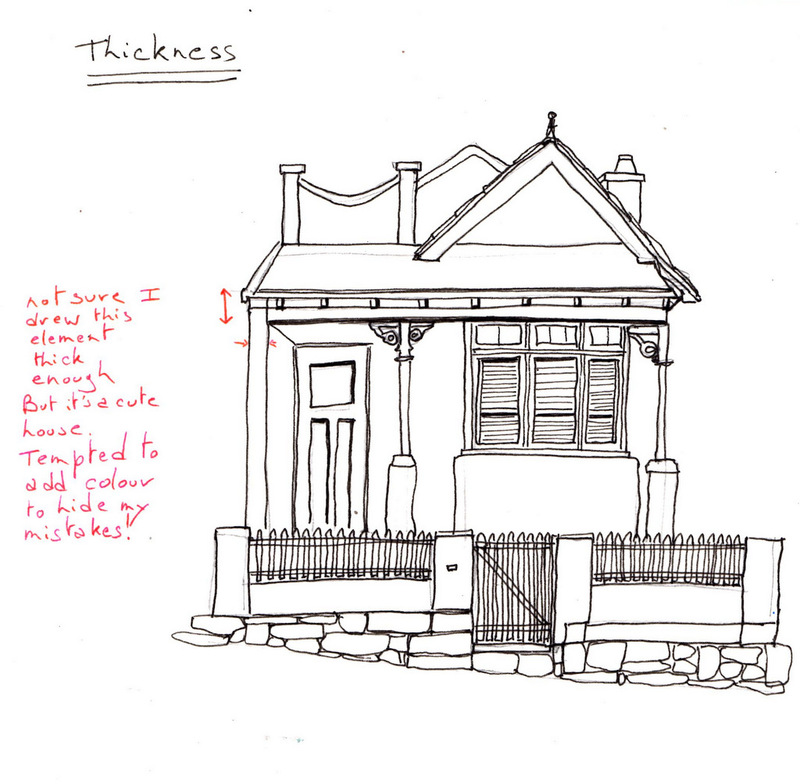 But I didn't sketch then. 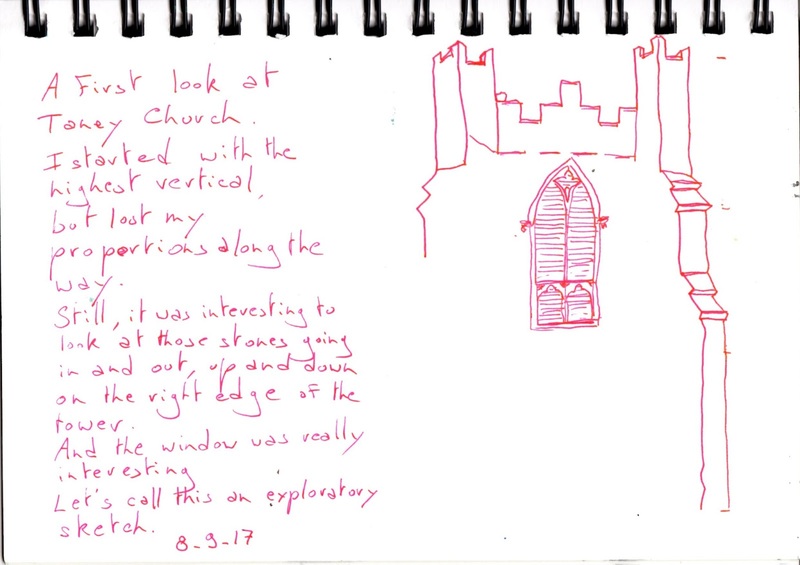 I certainly wouldn't have had the confidence to tackle a complex building like a church, that's for sure. This one was an indoor assignment, working from a photograph. 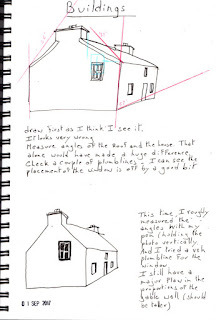 Exploring various ways to really look at a building, with continuous line drawing, negative shape painting (painting the sky), positive shape painting (paint the overall shape first, then add darker colours for roofs, windows, doors and cast shadows), and finally constructing volumes (trying to figure out how the building is constructed - a box in front of a box, a pyramid on top of box, etc). I think it's clear which method I enjoyed the most - once I took out my watercolours and a brush, I was in the zone, concentrating and enjoying playing with paints. 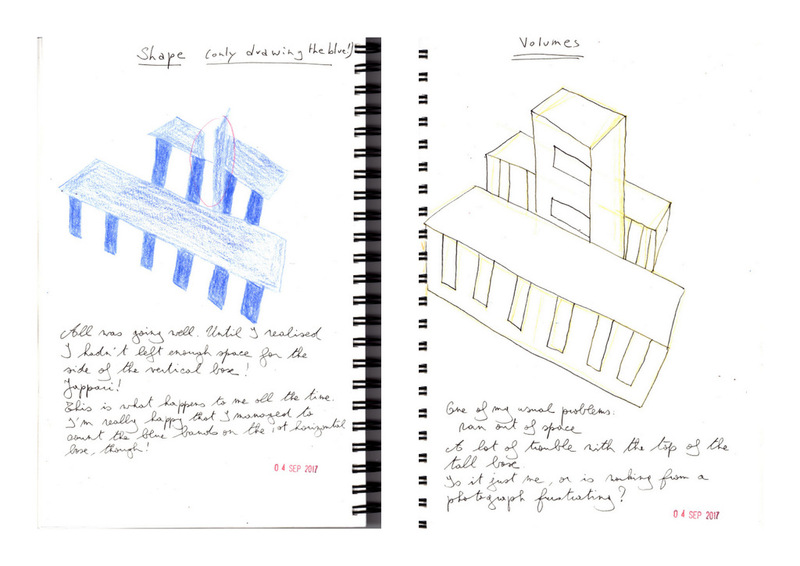 I struggled with the concept of constructing volumes, and the fact that it was the 4th drawing, I was expecting a lot out of myself - that somehow having done the other exercises, I would suddenly understand and "see" the building and that my pen would follow my eyes. The fact that this is initially a pencil sketch made it more difficult for me too. My inner critic (or my Left brain, whatever you want to call it, one of the other students calls hers "Debbie" I think. Mmmm, maybe I should name mine, it might be easier to control it) was ready to pounce, with all these things I "can't" do, can't draw a straight line, can't draw a roof, can't draw an arch! When I'm painting, Bruce, I think I'm going to call it Bruce, was thinking - There she goes again, painting like a child, I don't need to keep an eye on her. Because playing with paints isn't serious business. Whereas when she starts measuring, that's important, that means that the building has to be structurally sound, or there'll be casualties. And we can't have wobbly lines or wrong angles, or casualties for that matter. That would be a bad, bad, situation! Poor Bruce, I think I've finally discovered how to shut him up - an attack of buff titanium and moonglow! That will shut him up! I think that the first lesson of an online course is often about discovering, or acknowledging, how little you know, how much you have to learn! I draw confident lines, but they are rarely straight. And often they are going in the wrong direction. I enjoy shapes, but I get distracted easily. And volumes is a concept that still eludes me! This intro lesson was the hardest for me - I tend to jump right in without planning. With disastrous results sometimes. Working in a structured way means starting with the larger shapes, checking angles and relationships before moving to details and colour. 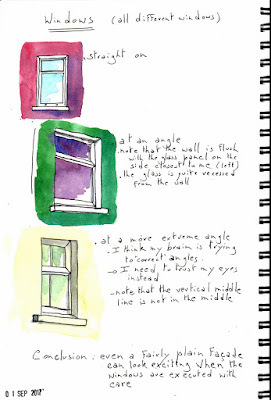 By relationships, I mean looking to see if the window is in the middle of the wall, checking that all the windows are at the same level, figuring out how many columns there are, how many panes in the windows - basically trying to fit everything into the framework. For this approach, it's best to start with pencil, and only when you have the broad outline making sense, then you can move to pen to add some detail, and finally going to watercolour for the fun bit! And I thought this little building looked easy! Since I don't take photos of buildings much, I had to go back to our trip to Australia-New Zealand (nearly 10 years ago!) to find some interesting places! Rakaia, if I remember right, was on our way from Kaikoura (where we went whale watching) to Oamaru (famous for its penguins!). Looking at Google Maps, it looks like there is a big bridge crossing a wide river bed. I remember that too. Although I think it's not the only town with that feature. Maybe we got petrol there? Or we just stopped briefly after going through Christchurch? I remember nothing else from this town, I have to admit. It was a long drive. And the scenery was wonderful, from start to finish! It's a pity it's so far away. I wouldn't mind going back! So interesting. Full of complexity. 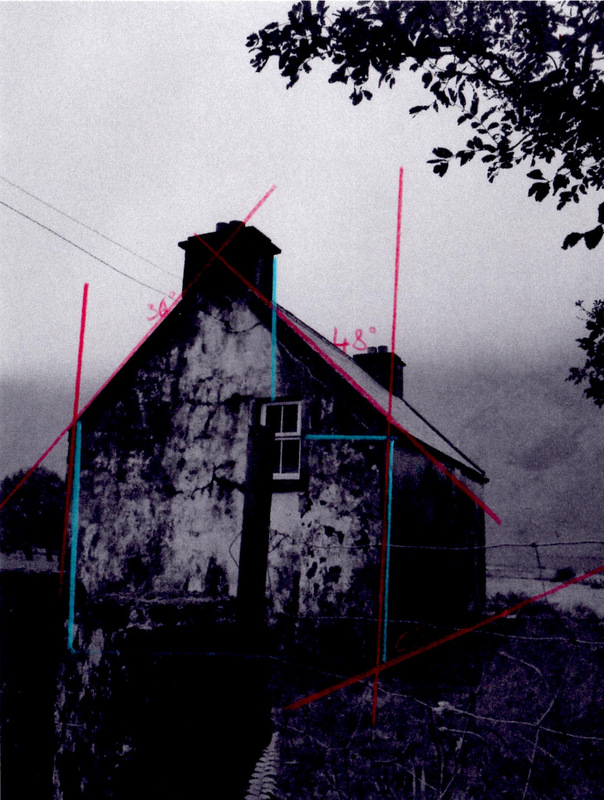 The three windows on this page are from houses on the Beara Peninsula. Two are really colourful, from the village of Eyeries, the perfect picture postcard town for tourists. I wonder do the locals get a Bord Fáilte grant to paint their houses every year? 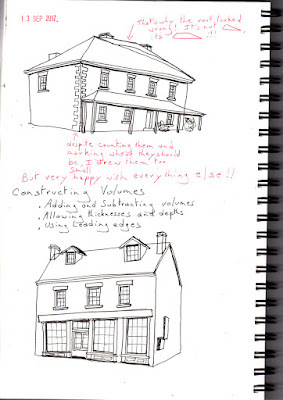 These houses would make lovely little watercolours, wouldn't they? Well, you can't answer that question because I haven't posted a picture of the full house, of course. It was a rhetorical question. Ah. Never mind. The third one was a house advertised for holiday rental near Lauragh I think. 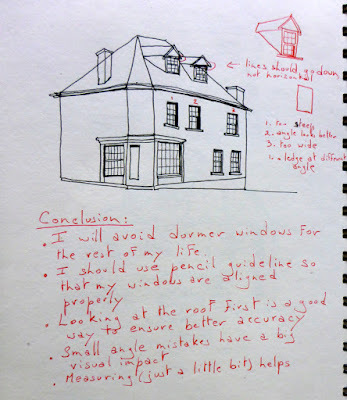 Buildings are a relatively new interest of mine. You've heard me wax lyrical about skies, seas, clouds, trees, but buildings, not so much. 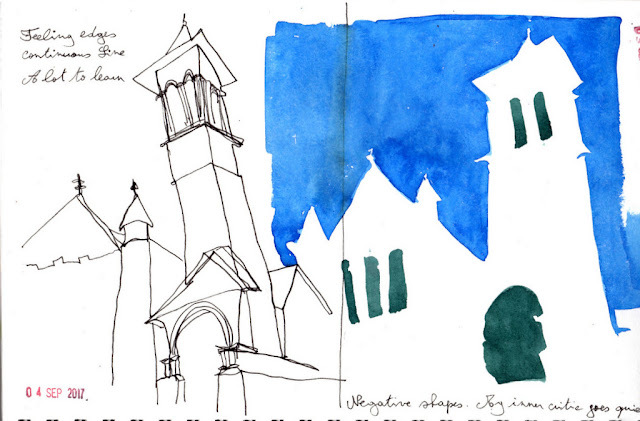 Despite nearly two years of urban sketching. Well, I guess I wasn't ready to really get into it. 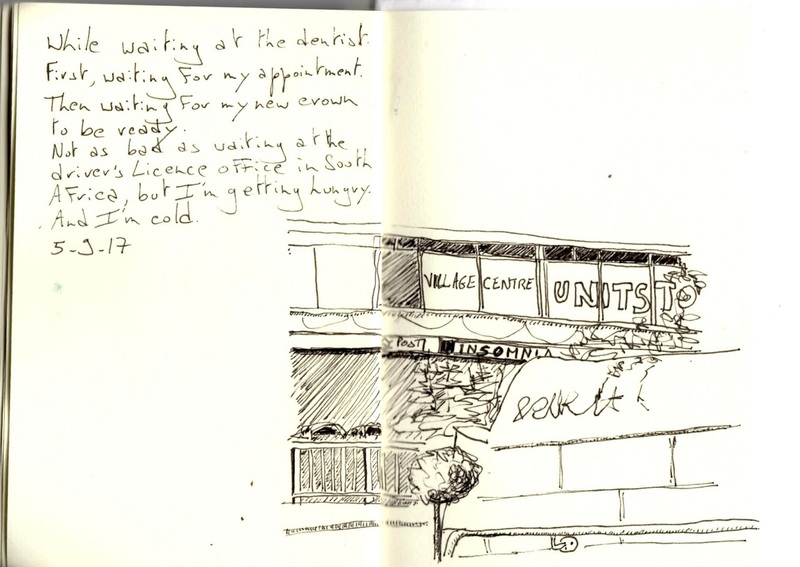 But now, with a plenty of practise in my Moleskine sketchbook, I feel confident enough to tackle this subject. And more importantly, ready to learn from scratch! If in doubt, find an online course! 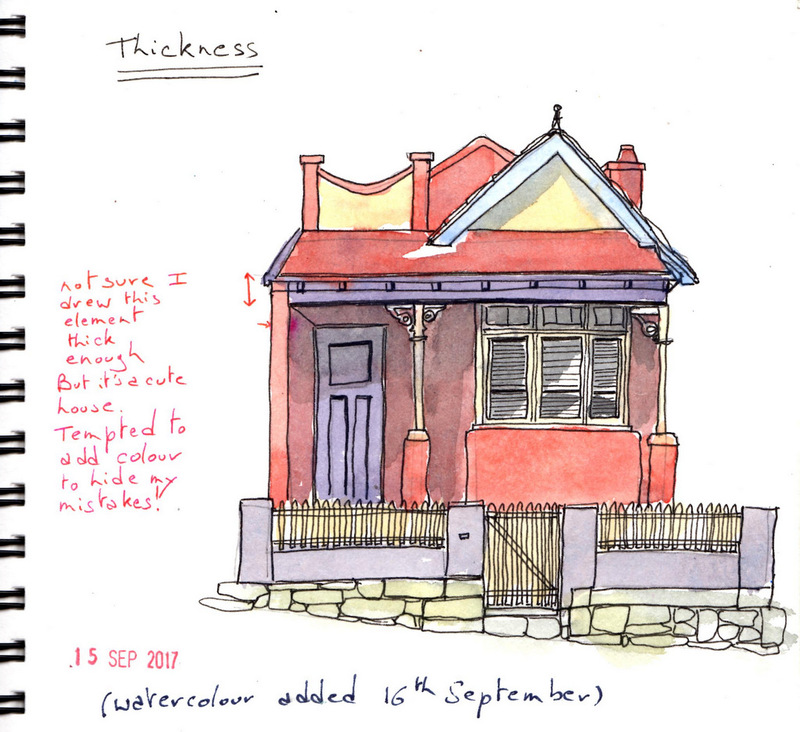 So, I have started SketchingNowBuildings. 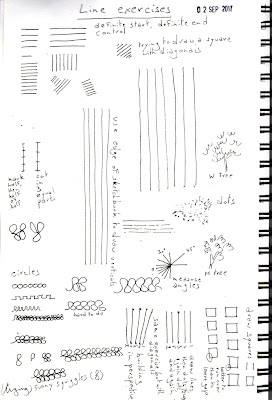 Here is my work from the Intro Lesson 1, all about checking angles and relationships. As you can see, even after checking the main angles, I still didn't get it quite right. 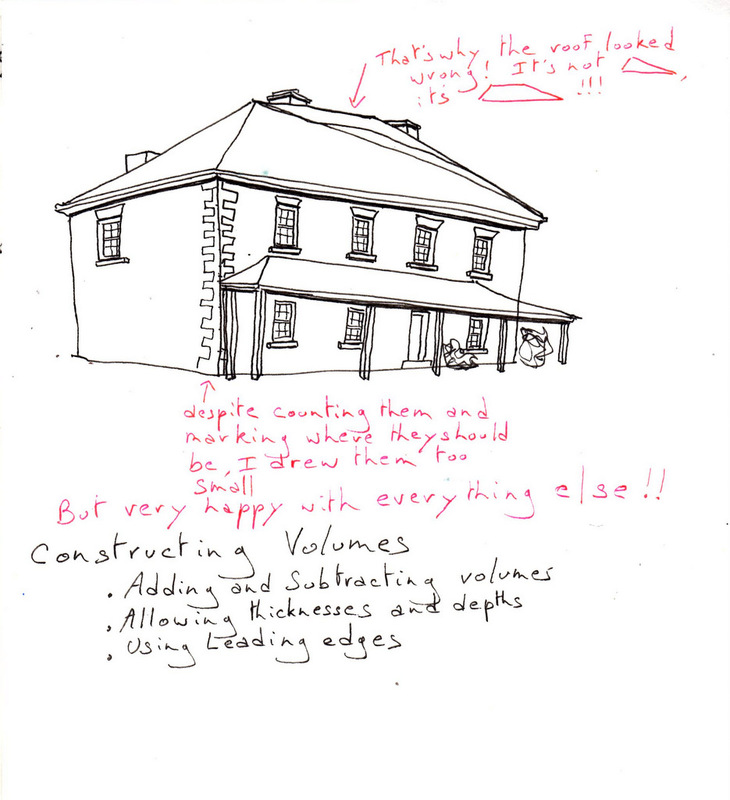 But it does look like a house that is structurally sound at least, unlike the first attempt! I think I will paint this house some day - it's beside the road in the Glenbeg valley on the Beara Peninsula, a lonely place on a wet morning. OK - still not feeling like painting a proper painting. But rather than wasting time, I picked up my paintbrush, found some photos in my Art Ideas folder and set to work in my painting sketchbook. How many sketchbooks do I need? How many do I have? I have about a dozen on the go, although I haven't touched about half of those in a few weeks or months. 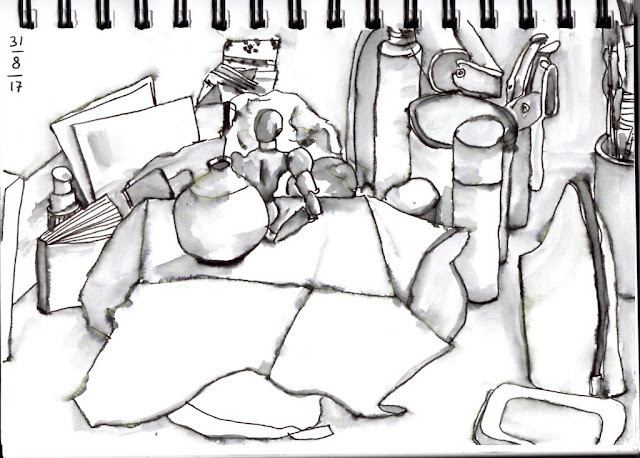 I have one for urban sketching, I have one for painting ideas, I have one for online courses, I have one for my handbag, I have one for travelling, I have one for sketching people, I have one with good quality watercolour paper, I have one with really cheap paper. Well, that's about all I can think of right now. It's too much really - I have this idea that if I was a proper artist, I would only ever have one on the go at any one time, and it would contain all the sketches and ideas of the moment. And I could track my progress chronologically. But that's not how it works for me. I need to compartmentalise. For some reason that I can't explain. And anyways, does it really matter? So, a flower and a landscape. I've tried to jazz up the colours. Maybe I needed to cheer myself up? To forget the cold wind and the frequent showers? My only conclusion from this little exercise is that I like red-orange and cobalt turquoise together. Will I now move to proper watercolour paper? Or continue dilly-dallying while I wait for inspiration? I can't say. But it's still better than watching the telly or browsing on the computer. I'm still not very inspired these days - maybe it's from looking at blogs of sketchers in warmer climes, who don't have to bring a waterproof cape and an umbrella every time they go out. But then again, they probably have to pack a sun hat and SPF cream, and lots of water to drink, and mosquito repellent! I don't have those problems. It's just that I'm finding it hard to motivate myself to get out and sketch. If I moan enough about it, surely it will go away? 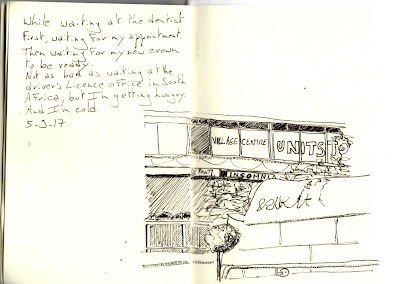 Still, I do carry a little sketchbook with me and dentist appointments are the ideal situation - even when everything is running smoothly, there is always some wait time. Are all dentists like that? Or is it just in Ireland? OK, the view from the waiting room isn't brilliant. But there is a view. So at least I didn't have to sketch the other patients! To me, this is really important: A yoga mat is a sacred space and you should never walk over someone else's yoga mat. Or put your feet on it. It's a question of respecting someone's space. Plus it's a hygiene issue. But because a yoga class is a non-confrontational space, I could say nothing when my (yoga) neighbour planted a foot on my mat. Inside, I was fuming! Actually, I was grossed out! I got over it. But still. Where do you stand on this question? If I can think of nothing to draw, my desk is usually a good candidate. It's full of junk, whose configuration changes constantly. The main challenge for me is the bottle tops - ellipses continue to resist me. Do you see the little guy sitting on the box? He is a Body Kun, or probably a cheap imitation. Well it was cheap, and it took forever to make its way here from China. And it didn't have all the accessories (guns and swords and the like). I would have liked a Body Chan instead. But the website wasn't very clear about what the product was. Well, although he loses an arm every so often, he's pretty good all the same. I must try and draw him better next time. I'm in a little bit of a "I have nothing to draw/paint" rut. I'm determined to work my way through it. But the lure of Netflix and Facebook is strong. The Hugh Lane Gallery is an old favourite of mine. I still remember the time when our car got clamped just outside, as we lost track of time on a visit there many years ago with one of our nieces. I love the rooms indoors and the ceilings, and those stairs. And the Francis Bacon Studio of course. But last Sunday was dry, for the most part, so I sat myself across the road and decided to tackle that façade! I couldn't sit right across, as a big tree was blocking my view of the top floor and roof. So I positioned myself slightly to the right. But I wanted to do a straight-on view. 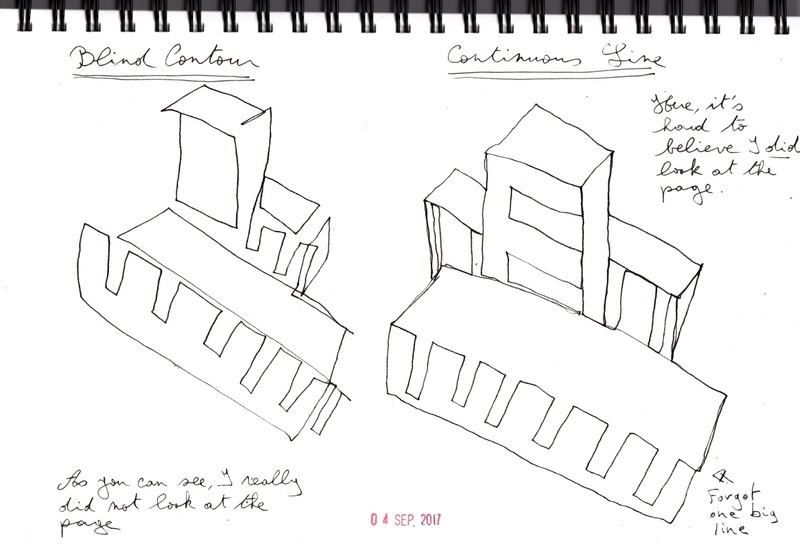 Just in case you were wondering why the chimney on the left is at a funny angle. 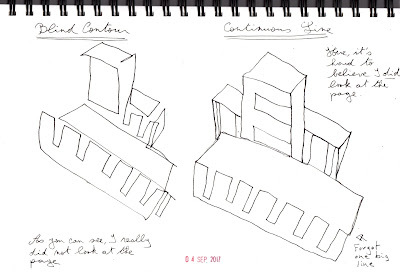 I just got a bit confused between what I was actually seeing (the chimneys are pretty accurate - the building isn't) and what I wanted to represent. I got confused with the middle floor too - windows way way too short. But it does look like the Hugh Lane. And it's a good end to this sketchbook, my own personal favourite so far. It's seen me through Inis Oírr, and Bloomsday, sunny days, a wet month of August, ... It's become like an old pair of shoes. 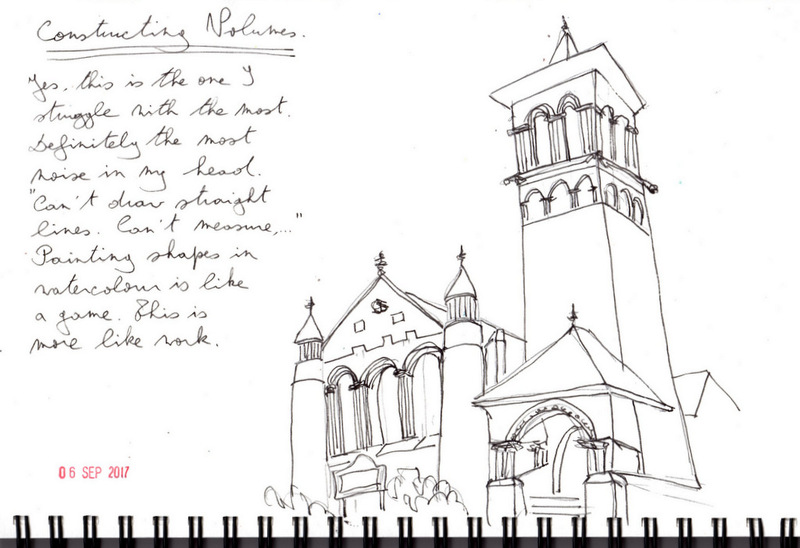 It will be strange to leave it behind when I go on urban sketching outings. Well, maybe I'll take it with me next Sunday. I just love showing it off. And it is a bit scary to start a new book. What if my first sketch is awful? I'm hesitating between another Moleskine like this one (A4, watercolour paper) and a smaller book, with thicker watercolour paper. 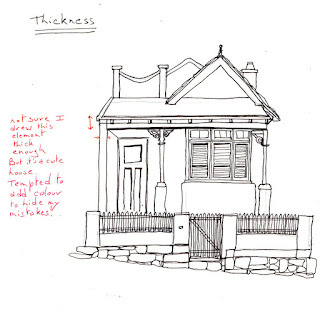 I love this format - it fits whole buildings and two hours of intense sketching. But maybe I should practise smaller details? PS: I'm really curious about the upcoming exhibition - The Ocean after Nature! There's nothing more boring than waiting for hair colour to take. 25 to 40 minutes with nothing to do. That's why I should always have my sketchbook with me. Not that it's my best look, but it is an excellent way to pass the time, and a good exercise in observation too. Better than reading Hello Magazine. I believe Kate is pregnant again, by the way! I wonder do other women feel the same as I do about going to the hairdressers? Or do they actually enjoy it? All that time spent looking at one's face, under unflattering light. At least I'm lucky - I actually enjoy chatting to my hairdresser - he's into art, and photography, and cinema. And he always asks me how my dog is doing! And he cuts my hair beautifully. I've followed him from Goatstown to Terenure to Stillorgan to Monkstown. 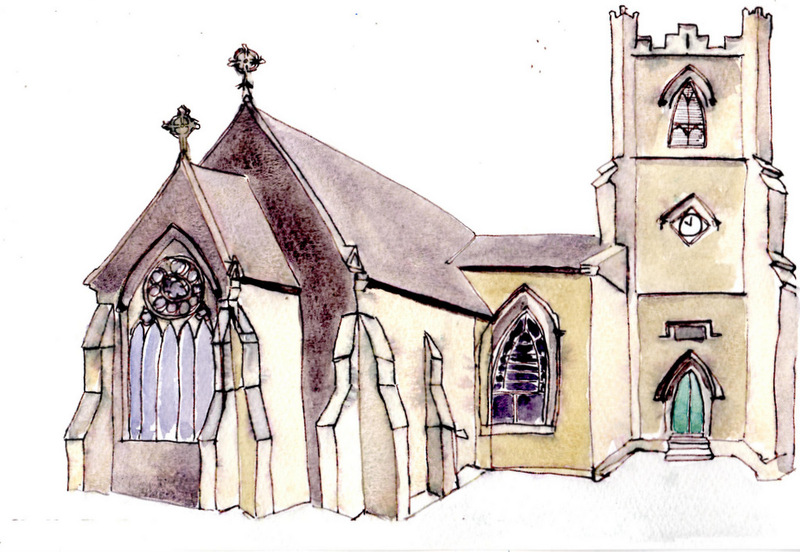 I like Monkstown - if I'm early for my appointment, I can sketch there - two beautiful churches, and lots of interesting houses. But one day, he will leave this country, and the search for the perfect hairdresser will start again. Trying little landscape abstracts, working wet in wet with just three colours on 15x10cm and 15x15cm paper (give or take). I should do more of these. They take no time at all and they are a great way to explore pigments. I must also try a wet on dry approach, layering transparent glazes. Lough Eske is a beautiful lake in Donegal. My sketch doesn't do it justice. As we were going to a wedding, I knew I wouldn't get much chance to sketch. (It was a great wedding, by the way - I got to wear a nice dress and I danced like I was 20 again, except my hips are still sore a week later!). But I brought my gear anyway, as we were away for a few days, and I thought I would have time on the Sunday. We were on the move a lot, the light wasn't right, I wasn't in the humour. I don't know! Well, it wasn't meant to be. 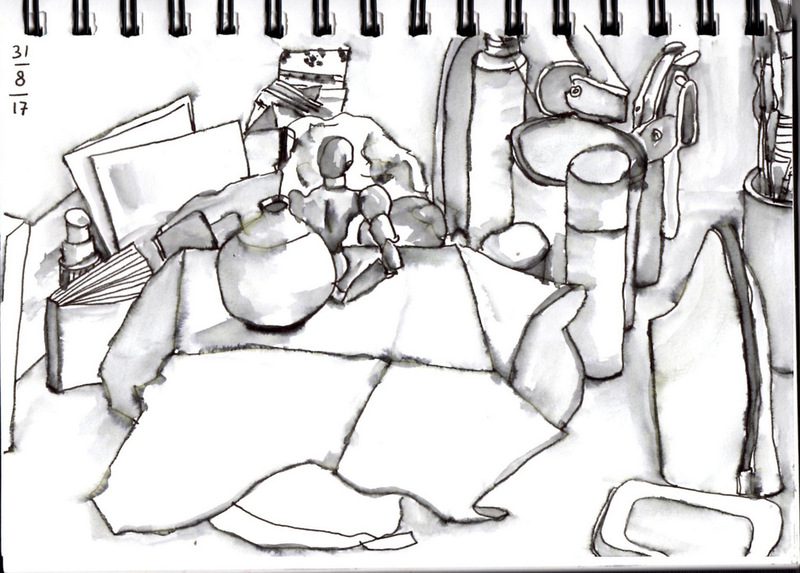 I find it hard to focus on my painting/sketching if I'm in the company of a non-sketcher. Maybe it's just me. I wasn't put under pressure to work quickly, but I just couldn't get into the frame of mind needed to paint. I'll keep trying though. 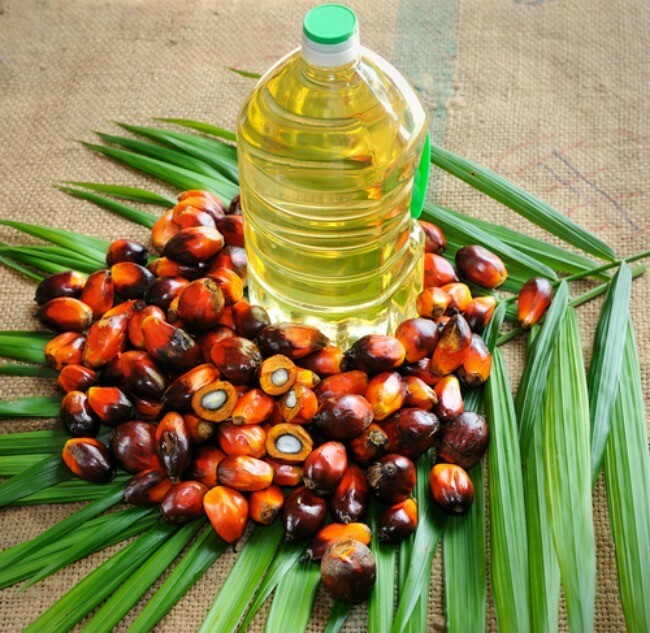 Palm oil seems to be in everything these days. In the last hour (this blog post was written a few weeks ago - I am NOT travelling again! ), I've seen it listed in every single brand of Belgian chocolate at Brussels airport, and in my ham and cheese croissant on the Ryanair flight. I haven't looked at the list of ingredients in the face cream I bought in the duty free, but I'm worried. How can I find chocolate without palm oil? I love chocolate, but instead of buying my usual supply, I only bought one bar. And this was my last Ryanair ham and cheese croissant. Sigh! They were delicious. I just refuse to contribute further to the cutting and burning of rain forests, which lead to the death of whole species, including the orangutans. And I'm not sure I can believe the "sustainable palm oil" label. So I'll do my best to eliminate anything that says palm oil in the ingredients. 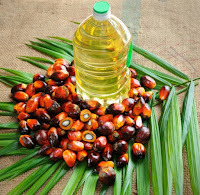 Not so easy, as I've just discovered an article listing all the names used on labels to name palm oil! And I haven't even looked at the label on my shampoo and conditioner! But I did check some yummy soaps I bought last Christmas, and they won't be on my list again next year! How much impact will my actions have on the world? Probably none if I'm the only one who cares. But I do hope things will change. Otherwise, it will be a bleak world for the next generation. Not that they seem to care much themselves. We're doomed!